Since 1967 Alfa Romeo's production plans envisaged the introduction in its wide range of 1300s of a new model featuring genuinely sports characteristics. 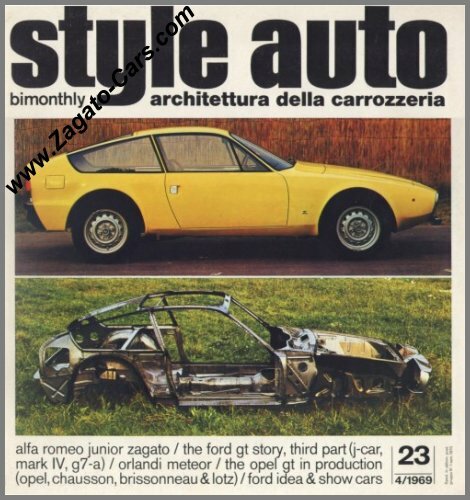 The Junior Z cars displayed at the 1969 Turin Motor Show were then not mere show cars but the first specimens of a model series that was industrially and commercially ready for the market. Though not yet at the slated manufacturing rate (without expecting the almost total production paralysis resulting from the trade union battle for the workers' contract renewal) . Owing to the peculiar demands of Alfa Romeo's customers and the recent trend of the "younger" segment of the international market, the 1300 series was bound to develop further into decidedly improved overall performance and marked sports features. 1. Streamlined form, to reduce drag as much as possible. 2. Compact size, to reduce overall dimensions and improve handling. 3. Lightweight construction, to improve the weight/power ratio, combined with stiffness, to ensure adequate road holding. 4. Original styling, for distinction of the new car from the other two sporty versions already in the range, the GT Coupe by Bertone and the Pininfarina Spider. At this stage, the basic architecture of the new model was practically defined: the Spider underbody - which has the shortest wheelbase in the 1300 range (225 cm) and permits rear overhang changes without important structural modifications - equipped with the Junior version mechanics, was to accommodate a 2-seater coupe body as streamlined, compact, light and strong as possible; in addition it was to be aesthetically valid and original. Regarding its production rate, Alfa Romeo estimated a relatively limited series (at least initially), in any case uneconomical if manufactured in its own Arese factory. For this reason, the decision was taken to sub-contract the supply of finished and trimmed bodies from a Coachbuilder who would take care of the design, increase the prestige and commercial value by "signing" the product and guarantee both its quality and quantity. With these concepts as a starting point, the name of Zagato was the logical answer owing to the extensive experience acquired by this Milanese body specialist in the field of sports cars and the remarkable flexibility of his plant, permitting high quality production - regardless of the volume being small or large - by adapting available facilities to suit contingent manufacturing requirements. With the basic layout dictated by Alfa Romeo Engineering, Zagato went to work on the body design at the beginning of 1968, developing the above four fundamental concepts in the manner described below. 1. Form: since the very start it was decided to spare no effort in ensuring aerodynamic efficiency but without any pretense of accomplishing results of absolute value: thus, the theoretical windtunnel research work was waived in favor of practical trials on the Balocco track, to test prototype external and internal aerodynamic efficiency by recording the performance data with varying formal solutions, the different tail configurations in particular. To have the least possible value for the product of Cd.S (which is directly proportional to drag) both factors were worked on, as usual. In this particular case, the drag coefficient (Cd) was reduced by tapering to extreme limits the front end, stretching the roof line as far as possible and truncating the tail in the best way. The front end tapering was obtained by fairing up to extreme limits the underbody and mechanical units, the size and location of radiator being two main unchangeable factors. The engine compartment cross-sections at wheelboxes were hence irreducible, while the front end cross-section was conditioned by the mandatory location of headlamps: front overhang length was thus determined by the suitably gradual variation of the intermediate cross-section areas. The same aerodynamic rule applies to all the other body cross-sections (to prevent the separation of the airstream and the priming of turbulent wakes): whence, the marked curvature of the sides (in plan view) with the consequent projection of wheelarches, typical of this car, and the stretched profile of the roof panel blending with the hood through the cowl in a smooth line, almost without discontinuities. Windshield rake and marked lateral curvature are fundamental for a correct blending of the greenhouse into the body within the boundary-limit of overall surface, in order not to promote any turbulences at the increasingly wider cross-sections. Also the reduction of the decreasing cross-sections is suitably gradual and the tail is truncated at the minimum break-away section compatible with the rear overhang chosen, the pressure center position and the rear end visibility requirements. The main cross-section (S) - the second factor affecting drag - was reduced by slenderizing the sides flush with the wheels, tapering the greenhouse vertically to a high degree but, especially, lowering the roof height as a consequence of the more stretched driving posture. 2. Size: one of the main aims of the design was to keep front and rear overhangs as short as possible. Rear overhang length was reduced to the limit of the spare wheel well which was moved forward as far as possible, into contact with the rear axle cross-member. obviously, also the form and location of the fuel tank, flanking the well, had to be modified. This drastic shortening was doggedly designed to reduce the overall length, the moments of inertia on bends, of pitch and of yaw under side winds, and to lighten the back window, etc. The assembled body shells delivered from Turin (through the Arese plant where they are pickled and primer-coated) are painted with acrylic finish and trimmed in the Zagato factory of Terrazzano di Rho. On the following pages, the Alfa Romeo Junior Z viewed from different angles; visible in the front view is the vertical asymmetric grille that allows air to the carburetors. The headlamps/signal lights cluster is certified as a unit inseparable from the Plexiglas fairing. Its specific functions, which are also the limit ones in case of roll-overs or collisions. Even though the problem was facilitated by the extreme rigidity of the Spider's underbody, careful calculations were made for some lightenings of its structural elements in order to ensure uniform torsional strengths. At this stage, an important and decisive role was played by the extensive experience acquired by Zagato in many years of high-performance car design. As regards body shell rigidity, fatigue tests (both flexural and torsional) were conducted in the Alfa Romeo Laboratory on the final prototype. Results indicated good characteristics which were hardly affected by service stresses. As may be seen in the graphs, twist is about 19' with an applied moment of 240 kgm and bending is about 0.7 mm with a 500 kg load on the center of gravity: the same moment and the same load give rise, respectively, to just slightly greater torsional and flexural values after body endurance testing (203,000 cycles), pointing to rather insignificant losses of its rigidity characteristics. The plotted patterns do not show marked curve inclination variations and this proves that the distribution of load-bearing elements was rational. As a consequence of the static tests results, the rear wheelbox interconnecting cross-rail was lightened, because it caused an excessive moment, and integrated by a sheet-metal bulkhead to increase its attachment section and improve distribution of loads. Further body weight reductions were obtained by fitting hood and doors of aluminum sheet. In running order, with the two occupants on board, the car weighs 1090 kg, 580 and 510 kg respectively on the front and rear axles. 4. Styling: the Junior coupe continues the aesthetic trend already established by Zagato's designer Ercole Spada with the Lancia Fulvia Sport and Rover TCZ prototypes built in 1967 (see Style Auto No. 15). The consistent evolution of Zagato's style has of late moved closer to an ever more subordinate dependence of the styling factor upon the rational prerogatives of sound design. curvature (also in plan view) of the backward shift of masses and concentration around the lowering of belt-line, the "stretch" and vertical taper of greenhouse sections, the typical "cut" of the ample glazed areas, the generously sized "transom" panel. Said general aesthetic characteristics, typical of Zagato designs, are joined by the features peculiar to this latest offspring of his: the wedge-shaped body side surface resulting from the lowered belt and front fender crest lines sloping down onto the nose and as much inclination of the tumblehome at rocker panels coincident with the door bottom cut. The high relief around wheelarches conveniently highlights the wheels, this being a typical "leit-motiv" of a sports car like the wedge shape and the truncated tail. The plexiglas fairing of the nose (aside from improving the penetration coefficient) visually envelops the front end with a reflecting surface that gives a "negative" idea of Alfa Romeo's distinguishing escutcheon. The flush paneling of the structural and mechanical components has determined the central raised section along the entire length of the hood, serving also to conceal the parked windshield wipers and admit under the cowl, at speeds over 60 km/h, quite a large amount of air for the ventilation and heating system. The "transom" panel drops straight down consistently with the body side tapered terminations - so that the projection of the bumper on the tail and sides (caused by the spare wheel) provides a desirable horizontal interruption in the vertical flow of the considerably massive caudal look. To offer a visual "lightening" of the ample truncated tail surface, the bumper panel is painted matt black, thus becoming a "negative" element. Lastly, worth mentioning is the total absence of chrome: the only two decorative elements, that is the plexiglas fairing and Alfa Romeo escutcheon reveals, are obviously confined to the front end. Coming to the cockpit, particular care was devoted to the air flow both in engine compartment and interior. An effective air renewal in passenger compartment is ensured by the depression promoted by lifting the back window, electrically controlled and adjustable to vary the amount of depression according to vehicle road speed. To prevent any interference on the outward suction of stale air the back window bottom edge is far away from the trailing edge of the roof panel and, hence, from the turbulence wake inception line. For the same reasons, the back window opening is flanked by two integral fins preventing any interference from the lateral air flow (in fact, the fluid fillets skimming past the body sides have a tendency to deflect vertically because of the roof upper curvature, in the absence of an equivalent bottom area taper to offset this aerodynamic phenomenon). Careful design has also gone into the seats to prevent an excessive pressure on the legs (with consequent poor blood circulation and driver fatigue) and provide occupants with a correct "lordosis" posture, with pressures as uniform as possible on their bodies. For the same reason, the headrests incorporated in seat squabs are reclineable in any position desired. The seat is slideable on an inclined plane in order to ensure ergonomically correct driving postures with varying driver sizes. The instrument panel is lined with a non-reflecting polyurethane foam crash padding which clashes strikingly with the polished aluminum paneling of the central console, the only objectionable speck (both functional and aesthetic) in the otherwise attractive and neat Alfa Romeo Junior Zagato interim styling.